You know how we're always saying how great it would be if someone could just make a modern, polygonal version of one of our favorite 2D classics, yet they seldom, if ever, turn out good? Well, Vanquish isn't a rebirth of any existing action franchise, but it is what a younger me dreamed a game like Contra would be like ... in the future. The work of Resident Evil creator Shinji Mikami and Platinum Games (Bayonetta), it brings the classic, run-and-gun feel of games like Konami's classic into the HD era with a plot that doesn't really matter, characters who spout ridiculous one-liners and -- oh yeah -- action that will have you on the edge of your seat from explosive start to thunderous finish. Like I said, the plot of Vanquish is really secondary to the action, but you need some set-up, right? Here's the deal: It's the future, yet the Russians (or at least a crazy faction of 'em) are once again sworn enemies of the United States. They've used a microwave emitter on an orbital colony called Providence -- the "51st state" -- to cook San Francisco. The President, who is sadly not a resurrected Ronald Reagan (thus completing the '80s Cold War motif), orders an all-out attack on Providence to crush the Red Menace, whose soldiers are, in what's surely a happy coincidence, red robots. Vanquish is not a deep game. The most cerebral it gets at any point is when, as DARPA researcher Sam Gideon, you need to read the telegraphed attacks of mammoth bosses while spotting their weak points (hint: they glow red). Sam's got a crazy power-armor suit on with thrusters that let him boost along the ground from one piece of cover to another and, basically, be really fast at everything. He also has a transforming, upgradeable weapons system that fires homing lasers, carbon nanotube death discs and other stuff. (It also shoots regular ol' bullets). There's no menu to slow down the action; as Sam picks up new weapons and upgrade chips, his arsenal gets more powerful. Basically, he's one quick badass with ridiculously powerful weapons -- and a serious nicotine habit. So there's sliding and cover and EMP grenades and basically all hell breaking out around Sam, but not once did I have to think about how to make him do what I wanted or worry about the camera while playing through the game. It's just rock solid. Everything in the game feels tuned to the nth degree for the express purpose of maximum fun. Yes, it's a very hard game, but when you die you know it was your fault. Plus, since Vanquish is also incredibly stylish, in those moments where you're about to bite the bullet the game kicks into slow-mo, giving you one last (super-dramatic) chance to prevail. Everything in the game feels tuned to the nth degree for the express purpose of maximum fun. From the moment Sam and his assigned group of Marines land inside Providence to the game's final moments, the bullets don't stop flying. Giant mechs assault them, levels collapse around them, massive spaceships almost crash into them. The gameplay in Vanquish may have been possible on the PSOne, but the presentation is pushing the 360 and PS3 into overdrive. There's so much going on, so much detail and so much ... wow that it's no wonder there's a button that makes Sam take a smoke break -- the spectacle simply has to be taken in. That said, not everyone is going to be taken by Vanquish. I've mentioned that it's tough as nails -- sometimes you're the nail, and the enemies are an unrelenting hammer -- and that will no doubt diminish the enjoyment for some people. You're also not going to find a lot of incentive to revisit the game once it's beaten, other than a quick action fix. It's a single-player experience that doesn't try to be more than it is. At the end of six hours, I was feeling as rough as Sam's voice from the challenge, but also coursing with adrenaline -- and a profound desire to walk around high-fiving everyone in sight. Vanquish is a supremely fun and polished action game that makes even Gears of War look like a leisurely stroll, and you simply must not miss it. 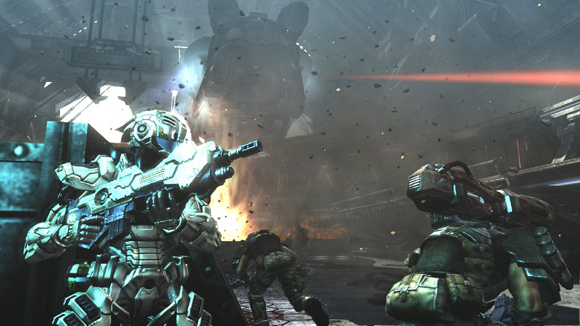 This review is based on early 360 review code of Vanquish provided by Sega.